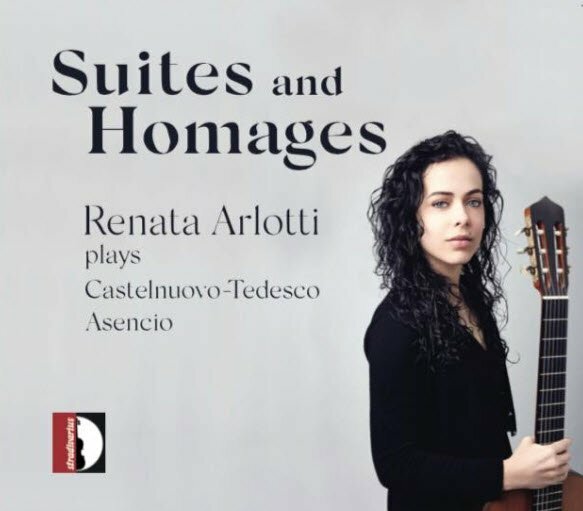 La casa discografica Stradivarius pubblica l'esordio discografico della chitarrista italiana Renata Arlotti intitolato "Suites and Homages". con enorme piacere condivido l'uscita del primo disco del duo Andrea Ferrario (chitarra) ed Elena Napoleone (pianoforte). 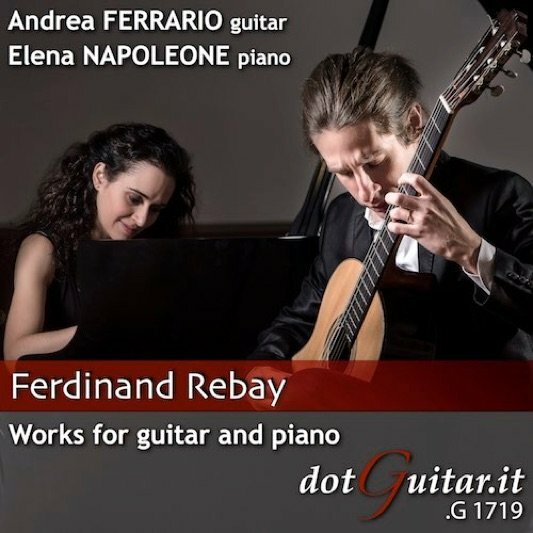 Ferdinand Rebay - works for guitar and piano è la prima registrazione delle musiche per chitarra e pianoforte del compositore austriaco. Attualmente il cd è in vendita on line su iTunes, Amazon o scaricabile su Spotify, ma verrà stampato a breve. Dopo alcuni mesi dall'uscita ufficiale per l'etichetta Dotguitar su Amazon e altri e-stores, finalmente è disponibile anche su ITunes il mio cd per chitarra sola dedicato a compositori britannici e americani (doveroso omaggio agli "alleati" dopo il cd che tanti anni fa dedicai ai compositori austro-tedeschi). La scelta dei brani è stata dettata dal desiderio di dare vita e risalto a lavori di un certo spessore, ingiustamente trascurati (o, comunque, poco eseguiti) che meritavano, per le qualità formali, estetiche, timbriche ed espressive, una registrazione (una prima assoluta per quanto riguarda Kerr, Wills, Persichetti, e J.Franco). Nel caso specifico, il punto di partenza è stato un programma per chitarra sola (incentrato su compositori famosi per le musiche da film) che, su invito di Angelo Gilardino, preparai anni fa. Ne facevano parte esclusivamente brani originali per chitarra di Arnell, Morricone, Rosza, Bennett, Arnold e Goldsmith. Proprio il brano scritto da quest’ultimo (Toccata) è stato l’unico “sopravvissuto” in questa nuova selezione. 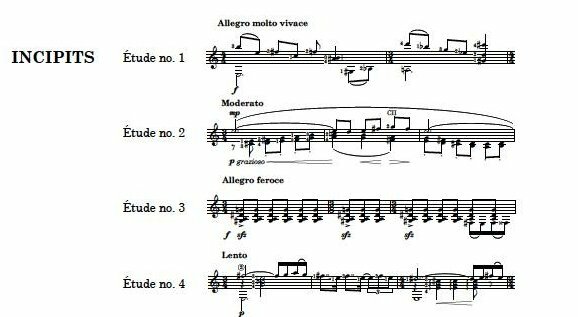 Ne è nato un recital di compositori contemporanei britannici ed americani, alcuni dei quali mi furono segnalati ugualmente da Angelo Gilardino. Un filo conduttore lega, a mio avviso, queste musiche dall’impianto formale molto diverso: “Lo studio sul suono effettuato non tanto (o non solamente) in funzione della varietà timbrica, ma che piuttosto va alla ricerca del cuore sonoriale stesso dello strumento”, come dice Gianni Nuti a proposito del “Tenebrismo” nel suo Manuale di Storia della Chitarra (ed.Bérben). Ciò mi ha spinto, dopo una serie di tentativi e ripensamenti, a disporre i brani secondo un ordine che, al di là degli specifici aspetti compositivi, porti idealmente l’ascoltatore a vivere un’esperienza ricca di suggestioni e stati d’animo diversi (sogno, irrequietezza, stupore, sgomento, quiete ecc.) nel segno della continuità ad un livello profondo di percezione. 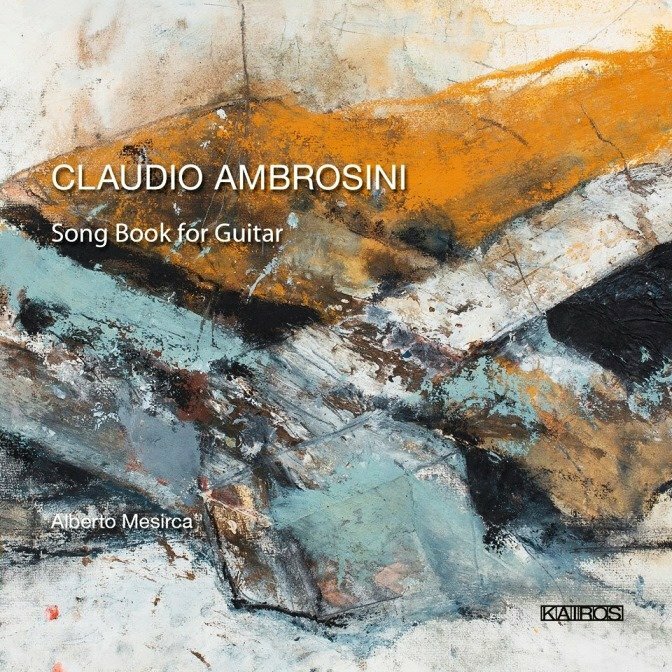 L'etichetta discografica Kairos inizia la distribuzione del nuovo cd del chitarrista italiano Alberto Mesirca dal titolo "Claudio Ambrosini - Song Book for Guitar" contenente i lavori più importanti del compositore veneto Claudio Ambrosini (1948) scritti dal il 1973 e il 2013. 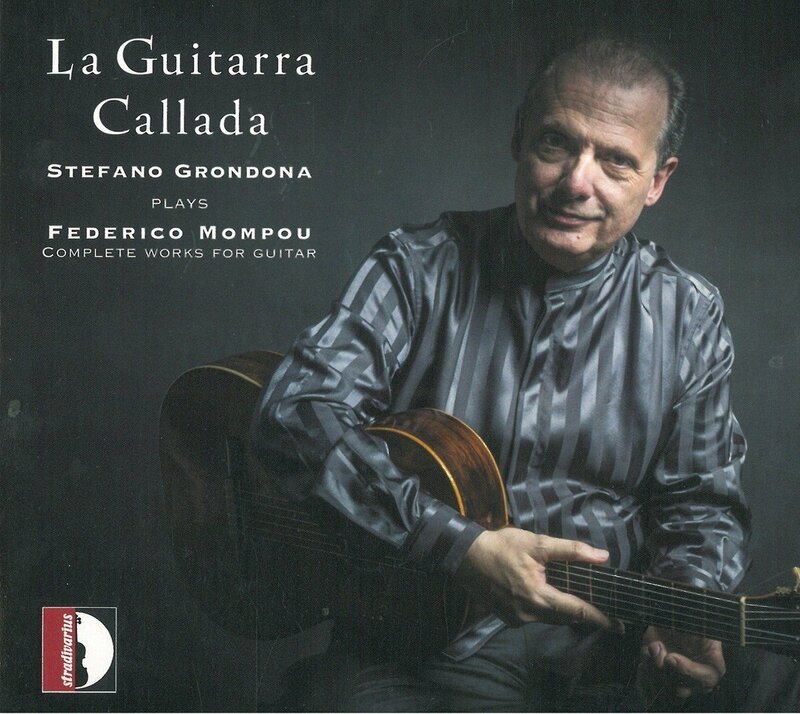 Il chitarrista italiano Stefano Grondona pubblica il suo nuovo CD intitolato "La guitarra callada" con l'etichetta discografica Stradivarius. This album is unique in that all of the pieces are originally composed for cello and guitar. Each piece takes the listener on a tour of the myriad textual and sonic possibilities that exist between these two instruments. Our recording seeks to illuminate underplayed pieces in an as-yet undeveloped genre. On both, we shed new light. The title, Cold Dark Matter, serves as a metaphor: Cornelia Parker's work depicts a garden shed and its contents held in suspended animation after an explosion. Familiar objects are seen in an unfamiliar circumstance, and from a new perspective, much like the combination of our two very familiar instruments. 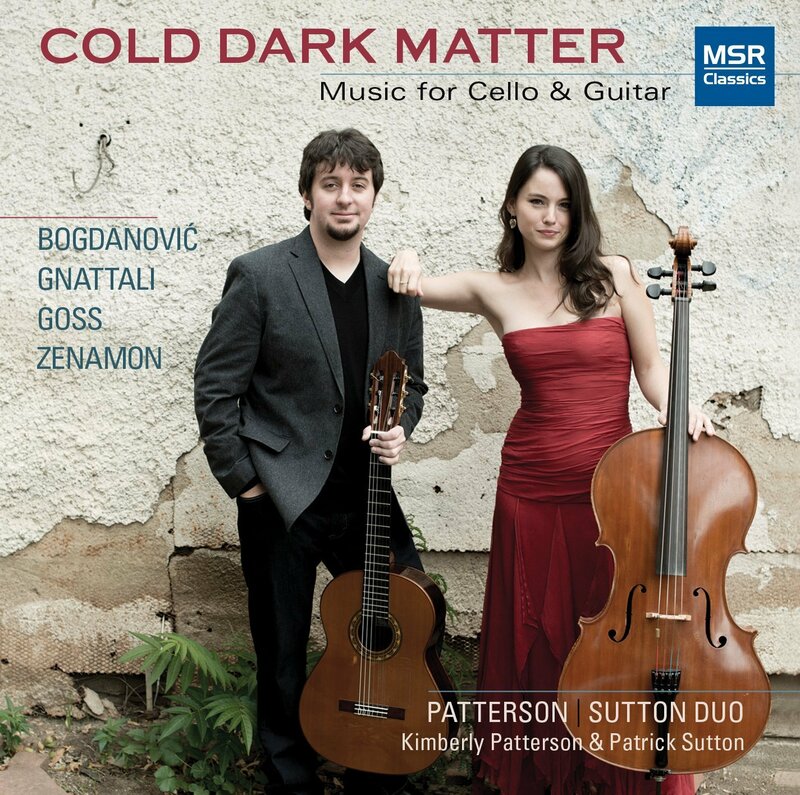 The Patterson/Sutton Duo has been applauded for their bravura performances, consummate musicianship and illuminating mixed-media lectures. The Duo explores the landscape of music for violoncello and guitar, and seeks to broaden its horizons through recording, performing and working closely with a range of contemporary composers. Described by the Chicago Sun Times as a superb cellist, Dr. Kimberly Patterson has earned recognition for her artistry as a solo and chamber musician. She has concertized extensively throughout North America, Europe, Asia and Australia, giving chamber recitals in Weill Recital Hall at Carnegie Hall, Wigmore Hall in London as well as Alice Tully Hall in Lincoln Center. Patterson gave the world premiere performance of Cayetano Soto's ballet for solo cello, Uneven, with the Aspen Santa Fe Ballet and subsequently toured throughout the United States. She is the founding cellist of the Tesla Quartet, gold medal winners of the Fischoff Chamber Music Competition and a prizewinner of the London International Quartet Competition. Dr. Patterson's festival appearances include the Verbier Festival in Switzerland, Miyazaki Festival in Japan, Sarasota Music Festival, the Aspen Music Festival, Holland Music Sessions in the Netherlands and Strings Music Festival. She is also an avid proponent for educational outreach and has received numerous fellowships to bring music to many communities. Graduating with academic honors from the Cleveland Institute of Music, Dr. Patterson earned a Master of Music degree at The Juilliard School and a Doctor of Musical Arts degree at the University of Colorado at Boulder, where she was the graduate assistant to the Takacs Quartet. She performs on a Joseph Rashid cello, generously loaned to her by the Rashid family. Patrick Sutton began playing guitar at the age of 11 in Evergreen, Colorado. He completed his Bachelor and Master of Music Degrees in classical guitar performance at the Lamont School of Music, studying with Ricardo Iznaola, Masakazu Ito and Jonathan Leathwood. While at the Lamont School, he received several honors, including First Place in the 2009 Lamont Chamber Music Competition, three Recital of Distinction awards, and induction into the Pi Kappa Lambda national music honor society. Sutton has been a prizewinner at several solo and chamber music competitions, and has twice been the John D'Addario Performing Assistant at the Bowdoin International Music Festival in Brunswick, Maine, where he performed at its Gamper Festival of New Music. 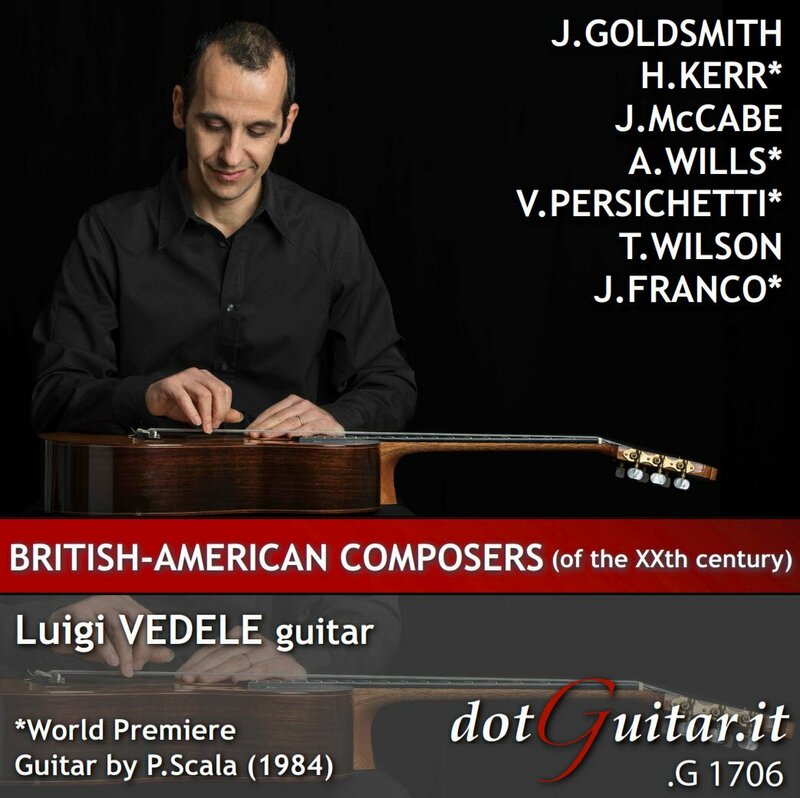 He has given numerous world and US premieres of pieces by important guitar composers, such as Stephen Goss, Gilbert Bibarian, Ricardo Iznaola and Richard Boukas. Currently on the music faculty of the Community College of Denver and Naropa University, Sutton is pursuing a Doctor of Musical Arts degree at the University of Colorado at Boulder. Dal sito internet ufficiale del duo è possibile ascoltare alcune anteprime e procedere all'acquisto su iTunes. Il CD del chitarrista italiano @Angelo Marchese interamente dedicato alla musica del compositore serbo Dušan Bogdanović (1955). 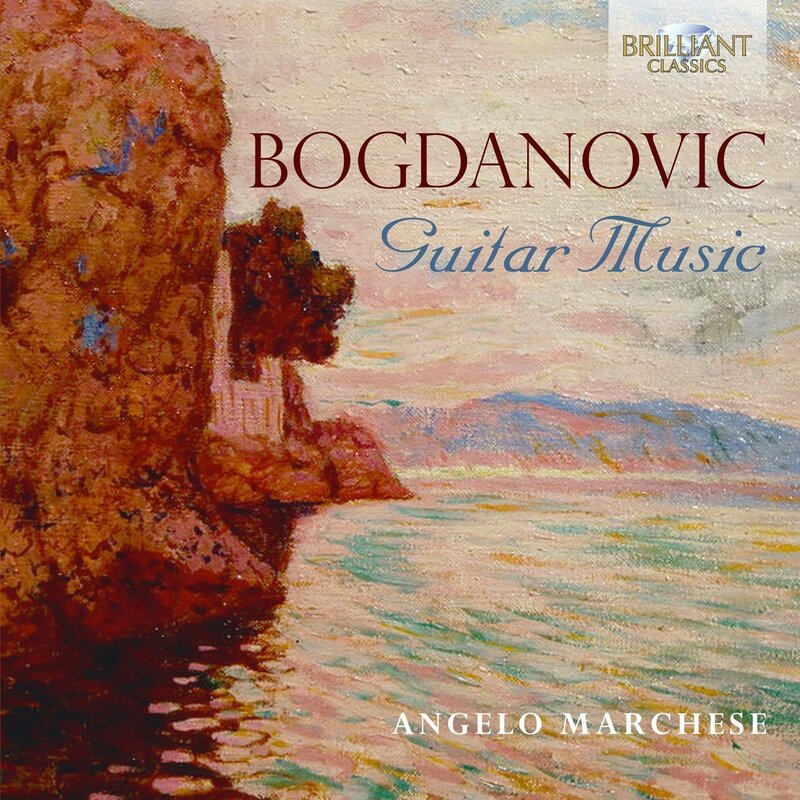 With sonatas, bagatelles, studies and dances, this disc forms a comprehensive introduction to the classically oriented section of the diverse oeuvre of the guitarist/composer Dusan Bogdanovic. Serbian by origin, long based in the US, Bogdanovic (b.1955) has made artistic collaborations with jazz, classical and ‘world’ musicians throughout his career. His distinguished pedagogical work has resulted in the publication of various method-books for guitarists and is represented here by five of his Polyrhythmic and Polymetric Studies (1990). The two sonatas are more substantially through-composed works. As Bogdanovi himself remarks in a useful booklet note, the first sonata (1978) betrays the influence of Bartok upon his early compositions, while the second, written seven years later, admits a much wider frame of reference, disciplined by the classical sonata model. 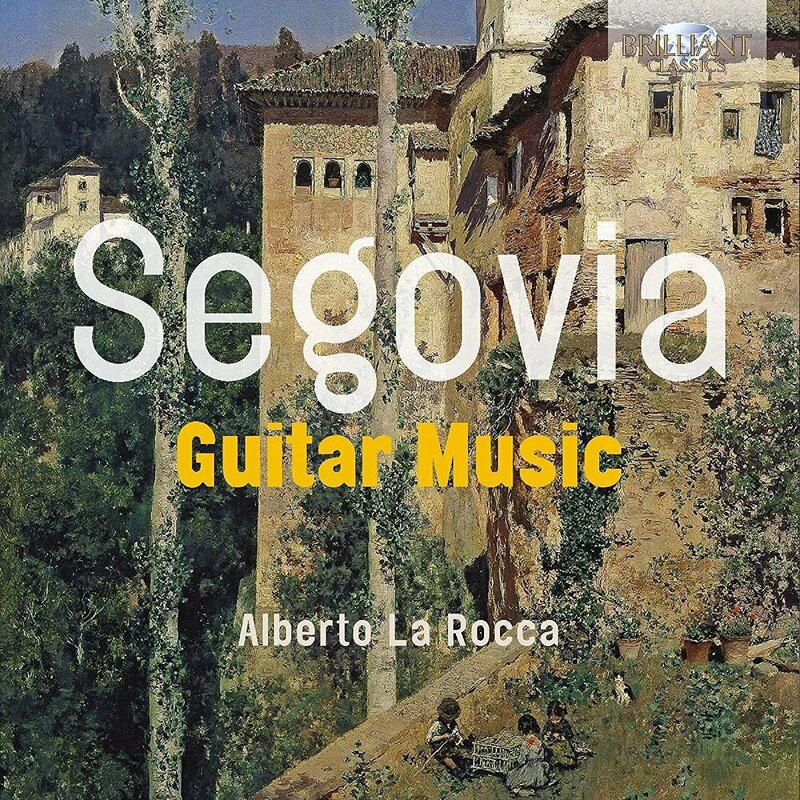 The resulting work has nothing of the generically Spanish flavour that is evident in so much guitar music, but takes its cue from the composer’s own mastery of the instrument to move between whimsical reflection and punchy, rhythmic momentum with some technical innovations that produce new sounds and tone-colours. The second Raguette pursues these innovations more single-mindedly: a brief introduction to the Indian raga tradition ‘meant for nervous Westerners’, melodically based on a work of John Dowland. There is also a first recording, of a work commissioned by Angelo Marchese, and inspired by the soloist’s native Sicily. In Cinque pezzi di Mare (2013), a romantic spirit of expression grows from material based on modes rather than standard diatonic harmony, enclosing a waltz which consciously evokes the idiom of the jazz pianist Bill Evans. This is an important addition to the extensive Brilliant Classics library of guitar music. Dusan Bogdanovic, born in 1955 in former Yugoslavia, is one of the foremost guitar composers and guitarists of today. A pupil of Alberto Ginastera and winner of the prestigious Geneva Competition he successfully toured the world’s continents as performer and composer. Bogdanovic’s style may be described as a fusion of classical, jazz and ethnic, a unique and personal style of strong expression and feelings. Guitarist Angelo Marchese is “an profound performer of supreme technical mastery” (Guitart magazine). 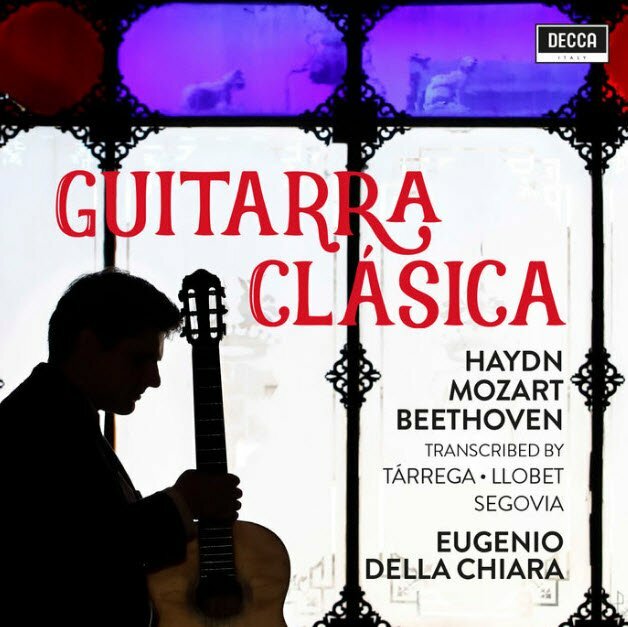 His recording of Gilardino’s guitar concerto for Brilliant Classics (BC94747) was widely praised in the press. The booklet contains extensive and authoritative liner notes written by the composer.